Brownies--now there's a case of a dessert with an identity crisis. What are they exactly? Cakey fudge? Fudgy cake? A bar? A cookie? All of the above? There are some mysteries which may never be solved. 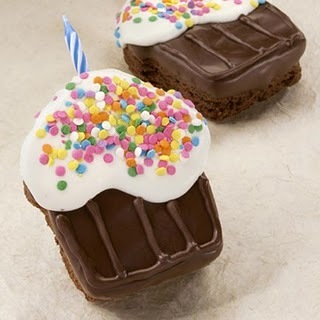 One thing is for sure though: brownies decorated to look like cupcakes are adorable, as proven by Simply Divine. A browniemaking factory based in Maine, Simply Divine makes gorgeously dense, chewy brownies comprised of ingredients you can actually pronounce. Sure, they have a classic collection (including the intriguing breakfast brownie) for brownie die-hards, but the true stars are their "decorated brownies". Decorated with thick layers of cheerfully-colored frosting and sprinkles, the adorable brownies come in a wide variety of shapes in addition to cupcakes too, including gold-dusted acorns, Maine lobsters, and rubber duckies. And they ship nationwide (not always cheap, but it's not about that, is it?). Talk about raising the bar (or cookie...or fudgy cake...or whatever they are).